Steve Woltmann | Loyola Athletics Senior forward Jenna Szczesny was voted preseason All-MVC this year. 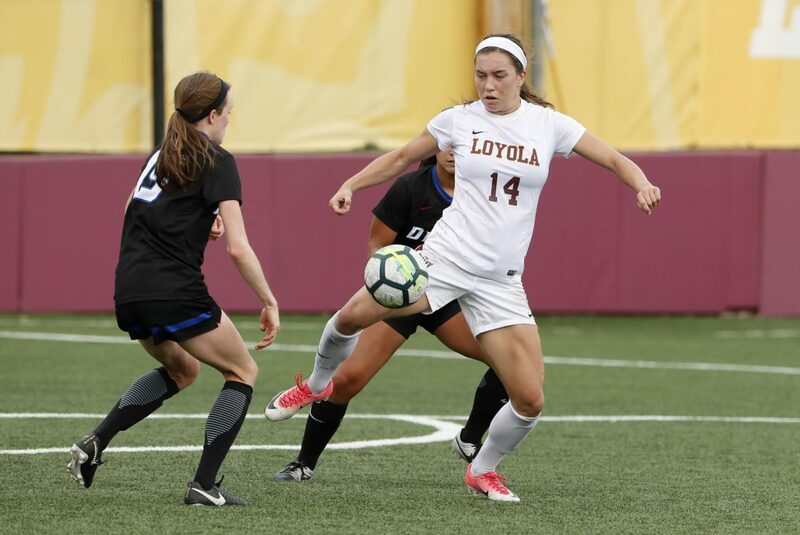 Results: The Loyola women’s soccer team (9-3-0, 2-0-0) traveled to Fort Wayne, Indiana, to take on Indiana University-Purdue University Fort Wayne Sept. 24. After putting on an offensive show, Loyola came out on top 6-1. What went down: The Ramblers picked up their sixth consecutive win as five different players each scored goals. In the fourth minute, junior forward Jenna Szczesny scored her Missouri Valley Conference (MVC)-leading eighth goal of the season to put the Ramblers ahead early in the game. The Ramblers continued with a swift aggression against the Mastodons with sophomore Aleksa Tataryn scoring in the eighth minute on an assist from senior forward Katie Grall. After a save from senior goalkeeper Maddie Ford in the 17th minute, Grall was able to find the back of the net to make it 3-0 Ramblers in the 18th minute. In the second half, sophomore midfielder Sienna Cruz scored off a corner kick from junior defensive player Taylor Lambouris in the 52nd minute. Shortly after in the 61st minute, Fort Wayne’s Breanna Buche scored to avoid being shut out. First-year midfielder Lindsey Hardiman was able to make the score 5-1 in the 65th minute, and Tataryn scored the last goal in the 69th minute. The victory marked the eighth time this season that the Ramblers have scored at least three goals in a game, and Hardiman was named MVC Newcomer of the Week Sept. 25. What’s next: The Ramblers are scheduled to take on MVC rival Missouri State University Oct. 1 at Loyola Soccer Park.